Though only 1.25 miles (one way), the Richmond Canal Walk should be a stop on any visiting runner’s bucket list. This concrete waterfront path is full of murals, interesting tidbits of Richmond history, and lamp post flags that advertise other activities to check out while in town. 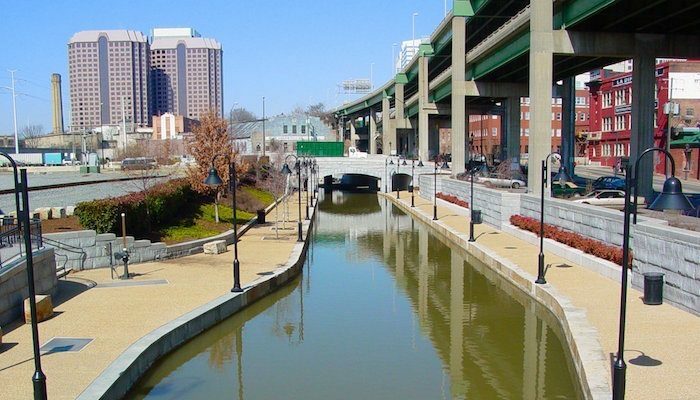 Not to mention, you’ll have great views of the tree-lined canal, bridges, and downtown architecture. On the west end, the trail connects with the James River Pipeline/Trestle Trail, which will take you across the canal to the Pipeline Overlook and Brown’s Island. From here, it’s an easy connection to Belle Isle via a fun run over the T. Tyler Potterfield Memorial Bridge. On the east end, runners can hook up with the Capital Trail for more mileage. The Canal Walk can be accessed at the south end of any block between 5th and 17th streets. One bonus: the canal trail is lit at night!